No matter how long it’s been since your last summer at camp, we cannot wait to reconnect with you! Not much has changed at Keewaydin’s camps over the past 100 years. Campers are still nervous and excited on opening day; parents are still sad to leave their youngsters and staff are still talented, larger than life characters. Sure, there are some new programs and buildings, but the simple values of the Keewaydin Way are still impressed upon each camper who passes through our programs. We are dedicated to keeping alumni in touch with each other, and with Keewaydin. If you are not currently receiving regular communication from us, we want to hear from you! There are multiple ways for you to connect with old friends and enjoy camp life, from reunions at camp to work weekends to regional alumni gatherings and Open Houses in cities across North America. Check out our calendar to find an event that works for you! John Watson Work Weekend on Lake Dunmore! There is nothing like a project to bring our community together, and opening up camp each year is a big project. We invie you to bring your work boots, jeans, and elbow grease to this year’s John Watson Work Weekend from May 31 to June 2 at 10 Keewaydin Rd in Salisbury, VT. Food and accomadations are on us, as always, as a thank you for your hard work! You can gain a new appreciation for Devil’s Island by making it more beautiful. The Work Party is an important part of putting the island in tip-top shape for the summer season. Join Tanya, Louise and the rest of the Ojibway crew for a fulfilling weekend of fun. Bring some friends and meet some new ones while you are there! Do you miss your summers up on Devil’s Island? 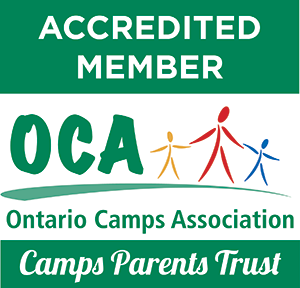 Do you have young children you would like to introduce to camp? Come to Keewaydin Temagami’s Family Reunion Weekend from July 5 – 9, 2019! Paddle around the lake, take a boat ride, go for a swim, or canoe to Ferguson Bay for a picnic lunch! Reconnect with old friends and make some new ones while watching the sunset from Devil’s Island! Join us from August 22 to 25 2019 for the annual Dunmore Alumni Family Reunion! Relax on the shores of Lake Dunmore while reliving your camp days. Bring your family- children younger than age 8 eat and stay for free! For registration, schedule and more check out the reunion page. You also register here. In a noisy, hectic world, it’s easy to believe that places steeped in nature’s soothing silences have vanished forever, and lasting tranquility is no longer possible to find. But spend just a single hour at Ojibway Lodge and you’ll discover that these and many other things you thought were gone for good can be still be had. In the northern reaches of Lake Temagami, a magnificent north woods eden is waiting. You’ll find it along wilderness shores that stretch for 4,800 untouched kilometers across a timeless dominion blessed with 1,500 hidden island jewels. This is the land of Ojibway. And it’s yours to wander. For more information and to book your stay, please visit Ojibway’s website.